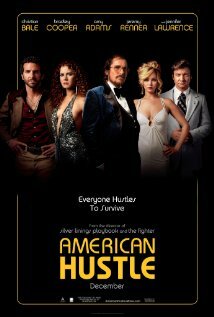 Columbia Pictures releases American Hustle on December 13th, 2013. NYC MOVIE GURU: Amy, how did you get into the sexuality of your character? Amy Adams: I was trained as a dancer, so it’s always part of how I storytell, through my body and through movement I find the character. One of the things that struck me— once I had the wardrobe and I knew she was going to be a sexual being—I really thought people who had an elegance with their sexuality and the power they had through their sexuality, so for me dancing was how I started to feel her. I thought about dancers who were in control because of the way they moved their bodies, so that’s what I started thinking about in the moment. NYC MOVIE GURU: Jennifer, what do you love about acting? Jennifer Lawrence: It’s a study of people and all of these things I’ve been doing since I was little that were always useless in Kentucky. Just watching people, studying them, and being able to mimic their body language and figure out a person, what kind of person you’re playing, how they move, and how they walk. But, between action and cut, it’s almost like meditating in a weird way because anything that you’re feeling, like if I’m cold between action and cut, I’m not; or if I’m in physical pain between action and cut, I’m not. I’m in a completely different frame of mind and it’s a high. NYC MOVIE GURU: What about you, Bradley? Bradley Cooper: Everybody at night they dream and go a little insane because that’s acceptable, and to me [acting is] a little bit like dreaming in a waking state because you get to study people and get to be a little insane and be obsessive of something and its expected of you and the more that you are [in that state], the better it is and I find that very addictive. Christian Bale: It’s definitely studying people. It’s nice. Everybody at nighttime, they dream and they tend to go a little bit insane, and that’s acceptable. To me, it’s sort of dreaming in a waking state because you get to study people and you get to go a little insane and be obsessive about something, and it’s expected, and the more you are the better it is. I find that very addictive. NYC MOVIE GURU: Jennifer, what was it like to film the scene where you're dancing to the song "Live and Let Die"? JL: We were going to go over the script before we started shooting and the director said he had a vision of Rosalyn wearing yellow cleaning gloves and running through the entire house singing, “Live and Let Die.” I said, “That sounds incredible. How’s it going to make sense?” I’m so stupid with these and like, “I’ll dance, I’ll sing, whatever,” but she’s so angry and she’s at this point where she’s been lied to for so long and left out of everything, and she’s getting to this point in this marriage that she’s been fighting for so long, that she’s been imprisoning this man for so many years in this marriage and she’s finally ready to let it die. So, I think that was this great, crazy moment. I threw my neck out, actually. NYC MOVIE GURU: Christian, how do you feel about the fashion style of the 70's? CB: I think it’s only over-the-top to us now looking back at the fashions in the era, because it was such a wonderfully exuberant era. It was like Halloween for a decade, and the colors were garish, and the style was just phenomenal for us to look back on. But the people themselves, we’re no different now. NYC MOVIE GURU: David, which actress from the Golden Age does Jennifer Lawrence remind you of? David O. Russell: I immediately think of Carole Lombard with Jennifer Lawrence.